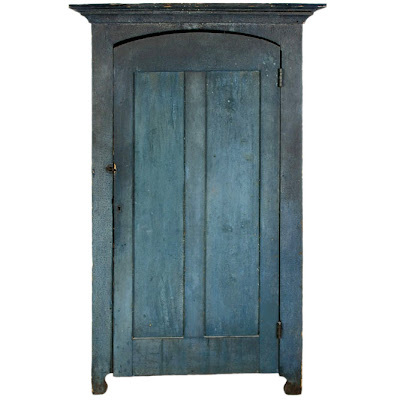 (Above) 1850-1880 19th C. BLUE PAINTED WALL CUPBOARD WITH ARCHITECTURAL DOOR, FROM ILLINOIS OR INDIANA. Click image for larger view. (Above) Detail. Click image for larger view. 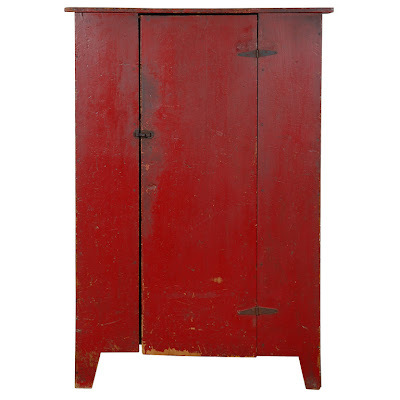 (Above) 1880-1890 19th C. FOLKY, FIRE ENGINE RED ORIGINAL PAINTED TALL ONE DOOR JELLY CUPBOARD. ALL ORIGINAL HARDWARE AND SHELFING. GREAT CUT OUT FEET AND FORM. FANTASTIC AND FOLKY COLOR. GREAT CONDITION FROM PRIVATE COLLECTION. Click image for larger view. 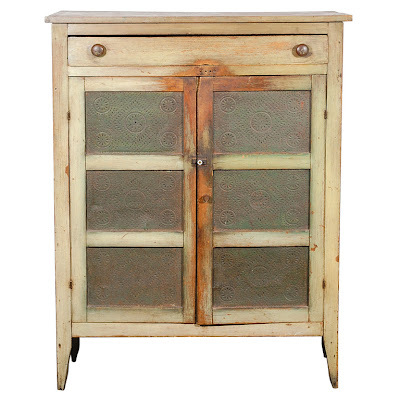 (Above) 1840-1860 FOLKY 19th C. ORIGINAL PAINTED, SAGE GREEN PIE SAFE WITH DRAWER. 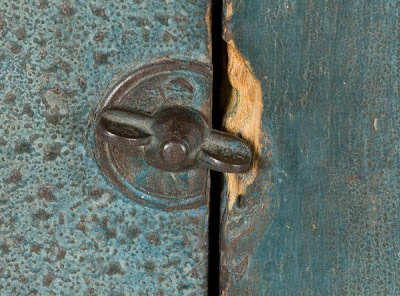 WONDERFUL ORIGINAL WORN PATINA AND HARDWARE. GREAT PAINTED AND PUNCHED TIN DOORS AND SUPER HIGH CUT OUT FEET. BEAUTIFUL PAINTED PINE AND THREE SHELF INTERIOR. GREAT CONDITION AND COMES FROM A PRIVATE COLLECTION IN THE MIDWEST. Click image for larger view. 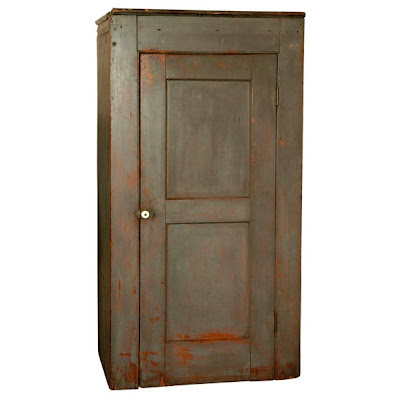 (Above) 1850-1860 19th C. ORIGINAL GRAY PAINTED 1 DOOR, HANGING WALL, CHIMNEY CUPBOARD FROM NEW ENGLAND. 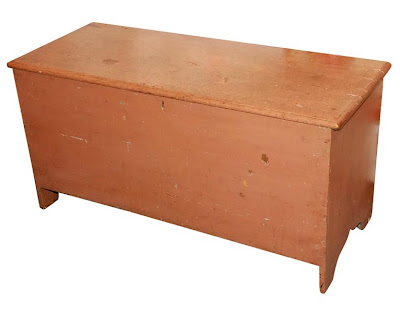 ALL ORIGINAL SURFACE AND SQUARE NAIL CONSTRUCTION. Click image for larger view. (Above) 1860-1870 19th C. ORIGINAL SALMON OVER BLUE PAINTED NEW ENGLAND BLANKET CHEST. MADE WITH EARLY CUT OUT LEGS AND SQUARE NAIL CONSTRUCTION. PINE WOOD AND GREAT SURFACE. Click image for larger view. 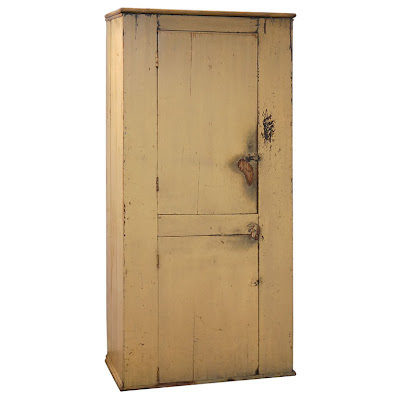 (Above) 1860-1870 19th C. ORIGINAL CREME PAINTED WALL CUPBOARD FROM OHIO FARMHOUSE. GREAT SURFACE. ALL ORIGINAL HARDWARE. SUPER CONDITION. ALL SQUARE NAIL AND PEG CONSTRUCTION. Click image for larger view. 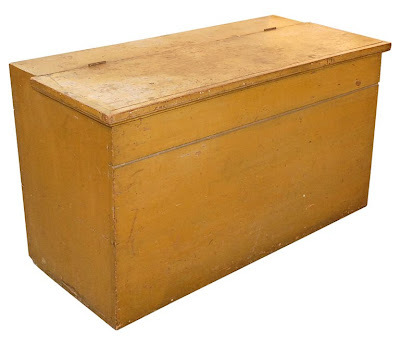 (Above) 1860-1870 19th C. EARLY ORIGINAL MUSTARD PAINTED MEAL BIN WITH GREAT SURFACE. SUPER EARLY COLOR WITH A CANTED SHAPE. FROM PENNSYLVANIA. VERY CLEAN INTERIOR. Click image for larger view. 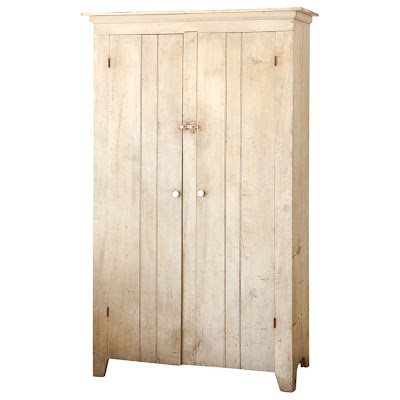 (Above) 1870-1880 19th C. ORIGINAL WHITE PAINTED TWO DOOR CUPBOARD WITH ORIGINAL HARDWARE. GREAT WASHED INTERIOR. 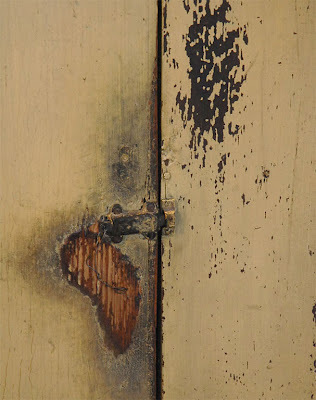 WONDERFUL ORIGINAL PATINA, FOUND IN PENNSYLVANIA. Click image for larger view. 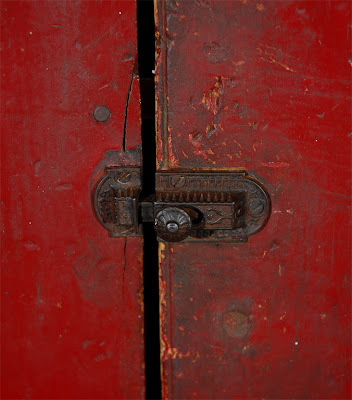 I HAVE SPOKEN BEFORE ABOUT HOW SURFACE WEAR AND PATINA CAN BE THE OUTWARD INDICATORS OF AUTHENTICITY, NOT TO MENTION construction, style, materials, and provenance. 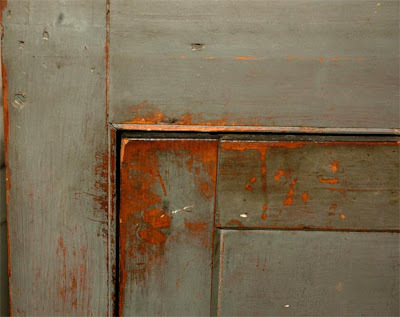 For objects such as these—utilitarian cabinets, blanket chests, cupboards, pie safes and such, original paint and surface wear are what you cherish, not hide. These examples, from Jeff R. Bridgman American Antiques, were found on 1stdibs.com. Enjoy, this Sunday, colors like mustard, sage, red, white, blue and gray in all it’s worn and lovely splendor. This is amazing! I wish I had at least one of these beauties.